Address: 54- Taj Road, Agra Cantt, Agra, Uttar Pradesh, 282 001 . Access: 7 kms. from Airport, 3 kms. from Railway Station, 3 kms. from Bus Stand . Facilities: Double A/C 235, Double Total 235, Suites A/C 2, Suites Total 2, Total A/C Rooms 237, Total Rooms 237, Centrally Airconditioned, 3, 500, 150, 3, 2, Indian, Continental, Chinese, Mughlai, Business Centre, Seperate Executive Floor, Room Service, H/C running water, Telephone, Fax, T.V., Safe Deposit, Channel Music, Tea/Coffee maker, Mini Fridge, Hair Dryers, Mini Bar, E Mail & Internet, Banquet Facilities, Conference Facilities, Beauty Parlour, Shopping Arcade, Health Club, Swimming Pool, Golf . Services: Doctor on call, Laundry, Money Changer, Banking, Safe Deposit, Baby Sitting, Valet, Fax, Telex, Florist Shop, Parking,left Luggage, Storage, Piano Lounge, Post Office, Travel Agents, Business centre, Indian Air Lines Office . Hotel Clarks Shiraz in Agra features 237 lavishly appointed and centrally air-conditioned rooms and suites including 80 Deluxe Rooms (23 TAJ FACING) , 155 Superior Rooms and 2 Suites. Superior Rooms : All rooms are centrally air conditioned with paid mini bar, tea coffee maker, television with remote control. Direct dialing facilities. Deluxe Rooms : All rooms are centrally air conditioned with paid mini bar and savoury basket, television with remote control, direct dialing facilitiy, tea / coffee maker, hair dryers, safe lockers, upgraded toiletries / amenities and fruit basket on order.Take a dive in the cool pool while our bartender serves you a Clarks' special. Savour the flavour of the Shehnaz Dining Hall, Bansuri Coffee Shop, Mughal Room - Roof Top Restaurant over-looking the Taj Mahal, Khayyam Bar, Mughal Bar, Pool-side, Barbeque, Cakes & Bakes and Lobby Lounge. Transform yourself inside out, whether it is a well sculpted body you're after or simply toning up those unexercised muscles, at our Health Club. Shedding those last extra pounds can be the hardest part, since you are close to your optimum weight, and motivation has run low. Enjoy our Entertainment Centre, fully equipped with Pool Table, Table Tennis and Air Hockey. A Centre for your complete entertainment. What do you think about Clarks Shiraz Agra? Everyone needs to visit Agra at least once in their lives. this was my 2nd and Mrs M's first.Chosen for us by our excellent agent in Delhi nad confirmed by us from checking the website.This has to be one of the nicest places to stay in India if not the world. Where else would you get a view of the Iconic Taj Mahal from your bedroom window? A clear and unobstructed view, not a neck craining glimpse! Nice green grounds to walk in and pleasant restaurants. A friendly salute from the uniformed doorman and everything was absolutely perfect. Check in, check out and the rooms. Lifts everything. I cannot praise this place highly enough bearing in mind its location in a very competitive city. I'm glad we paid the lower rate as this hotel did little to impress. Everything is old and outdated. But after traveling via car from Delhi it didn't matter. However the walls are paper thin and the wedding out in the court yard started at 9pm and went til 2ish with loud drums and blaring music. If you see an event set up move to the other side of the hotel. Breakfast was included but again wasn't anything special. It was edible and no one got sick so that's a start. Positives: Food was great in the restaurant on the top floor. The proximity to the taj and red fort was handy. This hotel was part of a tour and after the first hotel we were very pleasantly surprised. After arriving and settling in our rooms we were all in fantastic moods. The front desk and concierge were extremely helpful and professional. The pool was a nice little spot to chill out as was the little coffee lounge. Rooms were spacious and very clean and all the little freebies in the bathroom were a bonus. Thoroughly enjoyed our stay at this hotel, would stay again. We got a decent price using hotels.com but other things such as the restaurant, the beauty salon (where we got mehndi done) were rather pricey. But my friend and I felt it was worth it! We enjoyed spoiling ourselves there. As Lonely Planet mentioned, the hotel is showing a bit of age but still is a 5-star hotel w/ a doorman w/ big moustache and white princely outfit. I would recommend it again. Large, soulless hotel in need of a make-over. Catering for large tour groups, the solo traveller is treated like a poor relation. Because we had booked on-line we were not allowed to have the buffet breakfast but sent to an empty coffee lounge for toast and tea only. The rooms were large and well-equipped. None of the staff, tour agency, ofrflight agencies on site were prepared to help us confirm flights as we had not booked with them and, therefore, they were getting no commission. The hotel was convenient for the Taj and we found a very good auto-rickshaw driver outside named Rakesh (Ricky) who took us around locally and stopped us at very good and cheap restaurants. We also went further afield by taxi to Fatehpur Sikri. The hotel had a good swimming pool area but it was too cold to swim when we were there. We stayed in the refurbished Tower Wing,clean spacious ,well presented room.The staff were friendly,dinners were very good.Meals in the Coffee shop,tasty & ideal for a light snack. Located out of town,ideal for those wanting a quiter location. Well worth the stay. We stayed in the Tower Wing, which was recently renovated. 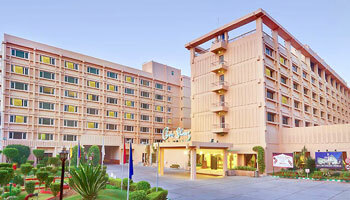 The rooms were impeccably cleaned and the service staff extremely friendly and helpful. The variety of breakfast is good with a selection of Continental and Indian items, and the quality of the food was fabulous! The hotel claims that they have rooms that face the Taj Mahal. True, but the view is tremendously small, so there’s no difference between having a room with a view or not. The most unfortunate thing we faced was with the front office staff who argued with us over some laundry pieces that were not finished by the time we checked out. Instead of waiving the charges of a service not rendered in time, he told us that he still had to charge us, as it was a cancellation at our end. Overall, the experience and stay at this hotel is definitely value-for-money. This was the worst hotel of our entire trip and we stayed in four different hotels in India. Location was such that there was not much around, food was so-so, and rooms were in bad shape and needed updating. I would put this as a $50 a night room in the USA. Bugs on bathroom floor, a/c not up to par, and food just so-so. I would not go back. Lights went out about 5 times a night in the evening hours, so we were afraid to use the elevator. Stayed here for one night on a solo tour. This hotel is definately geared towards the large tour groups but it was not too busy during my visit. Overall the hotel is adequate and clean, it has a small bar and a couple of restaurants and some small gift shops. Room was clean and ok, but no Taj view. The food was average, I had the buffet along with the hoards of groups which also dined in the restaraunt. The power went three times during my stay, the last time I was stuck in a small lift for 25 minutes with some fellow guests...not a pleasent experience...the staff were matter of fact about it so it must be a fairly common occurance! Overall this hotel is definately not a 5 star hotel, by western standards I would class this as a very good 3 star hotel. We stayed there as part of a tour (Adventures Abroad). It was nothing great but just fine—nicer than the Clarks in Varanasi. It has a restaurant and outdoor area that supposedly has views of the Taj, and I went up their at sunrise time, but like most mornings it was totally fogged in and invisible.